Hear ye, hear ye: princess Zulda (wait, what?) has been kidnapped, and the kingdom has need of a hero! A hero willing to travel to Stuffia Island, ascend Dark Castle, all the way to highest tower where she’s being kept. What, how do we know all this? We just do. Now on you go! There’s a princess in need of saving and not a moment to lose. 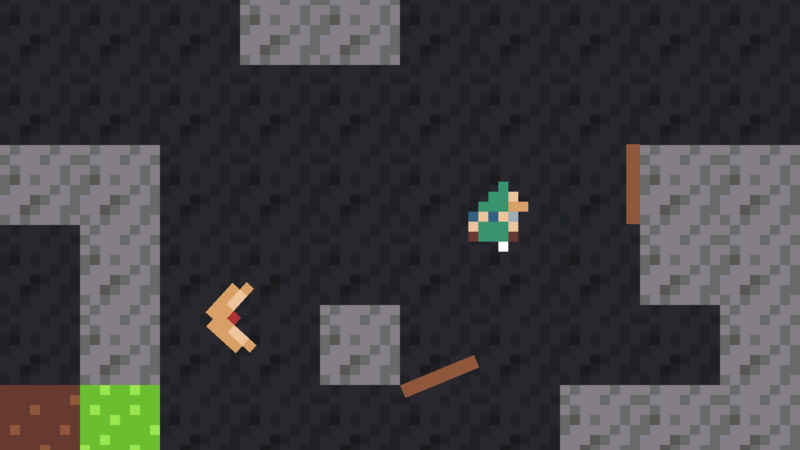 So go on, do embark on… Lonk’s Greedy Adventure! That about sums up what I knew prior to playing this Ludum Dare 40 entry, and boy was I in for a pleasant surprise with this pixellated platformer. I mean, the Zelda influence is obvious – boomerang, shield, Zulda, Dark Castle, and so on – but that doesn’t automatically make for a bad game. Not in the slightest, so long as the inspiration is used properly. Which, in spite of having only discovered two endings, I’d say this is certainly a case of just that. Oh, and you get to Stuffia Island by way of cannon. Yup. Now, during the fifteen or so minutes I spent exploring Dark Castle as Lonk, a lot happened, including me getting the protagonist killed several times, not always unintentionally either! What can I say? I simply couldn’t help myself, curious as to whether he’d actually die by falling into lava, what would happen if I tried to break the rules, and of course, whether leaving a certain object alone would in fact be the best course. It was just too much fun, and unless I actually stumbled upon a proper ending (which always included an ironic ‘cutscene’ of sorts), eh, Lonk would respawn nearby immediately anyway. But obviously there’s more to this one than unlocking endings and messing around with the life of its protagonist, as while I did not reach the princess prior to writing this article, I did accumulate a sizeable amount of… loot! That’s right, loot. Items. So many items, all of which unsurprisingly draw inspiration from a certain Nintendo franchise, including bombs, boomerangs, and so on. These were all designed to help Lonk progress, enabling him to create platforms, flick switches, clear passages – you know, the usual. Along the way, signposts will help, hinder, or even attempt mockery, and you’d do well to read these, if for no other reason than high odds of a giggle at their parodic nature; much like the rest of the game, however well-designed. Hard to believe that javicepa managed to create such a lovely experience in less than 48 hours, ya know? In fact, why not stop by the Ludum Dare website to sample his lovely creation yourself? Lonk’s Greedy Adventure awaits! Note: post-compo version was played for this article.